First off, I have to say that I have some experience with Junk rigs having designed and installed a couple of them before. One in an experimental proa and the other on a salvaged 18 ft day sailer (pictured to the left) that was later used for sailing the east coast of Vancouver Island. 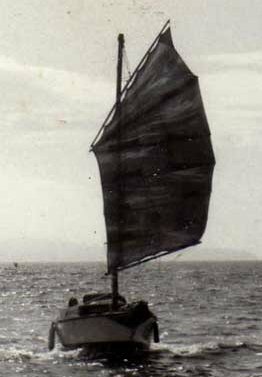 On the 18 footer hull the sail was a painters drop sheet; the mast was a discarded aluminium pipe stuffed with a 2×4 wood cross for stiffness; the batons where bamboo poles from Chinatown; the yard and boom where made from scrap wood. The whole rig cost me under $100 to make and it sailed great! I’ve been hooked on Junk rigs ever since. My interest in designing and building Junk rigs came from discovering and buying the then newly published book Practical Junk rig by MacLeod and Hassler back in 1992. At the time it just seemed a cheap and easy way to get a working rig up on a hull. After sailing with the Junk rig for a while I came to appreciate its benefits and advantages over the more excepted Western rigs such as sloops, cutters and ketches. The rig is safe and and easy to handle compared to Western rigs. It can be maintained and repaired anywhere in the world or at sea with no need of specialist rigging fittings. The entire rig can be handled, including reefing and hoisting sail from the cockpit (or even from an enclosed compartment) with no need to go on deck. A large Junk rig can be easily handled by one person. Reliance on an auxiliary engine is reduced if not eliminated. For a long distance cruiser such as myself the rig has simply too many advantages to ignore. The fact that it requires no standing rigging is a huge bonus. All standing rigging fails eventually. It’s not a question of if but when. I have it happen to me but was fortunate in no loosing the entire rig – and event that happens all to often on Western rigs. The only way to avoid rigging failure is to replace all rigging wires every few years at enormous expense and bother. And even then there are no guarantees. Personally I prefer to cruise with peace of mind, not chewing my fingernails wondering what’s going to fail next. For these reasons I am planning to completely remove the mast and rigging from my boat and replace it with a Junk schooner rig. This entry was posted in junk rig and tagged junk rig, schooner. Bookmark the permalink.